In 1987 Julia Staigers and Gerard (Jerry) Koschal were living in Albuquerque, New Mexico. Their children were now grown and out of the house and they were ready for the next big adventure. 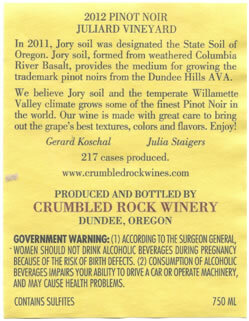 They decided that Oregon’s Willamette Valley was an ideal place to relocate. They purchased ten acres including a house, shed, fruit trees and 4.5 acres of grapes (Chardonnay, Riesling and Gewürztraminer) on Worden Hill Road not far from the town of Dundee. The vineyard was named Juliard, combining Julia and Gerard. The vineyard was upgraded and expanded over the next few years and eventually totaled about eight acres planted mostly to Pinot Noir with a small amount of Riesling. 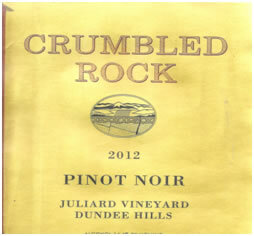 In 2015 it was time to retire and the property including Juliard Vineyard, Crumbled Rock Winery and their house was sold. Erath Winery purchased their grapes for many years and often made single vineyard “Juliard” wines.